Disney’s Pirates of the Caribbean, “Dead Man’s Chest” and “At World’s End,” both express the similar dread and fear of death. In Pirates of the Caribbean: Dead Man’s Chest, Davy Jones, captain of the Flying Dutchman, recruited more pirates for his ship by asking them one question, “Do you fear death?” Davy Jones sought dying people willing to delay death by serving 100 years on the Flying Dutchman. Similarly, in Pirates of the Caribbean: At the World’s End, Jack Sparrow is pained between obtaining immortality for himself by taking Davy Jones’ place as captain of the ghost-ship, the Flying Dutchman. Pirates of the Caribbean assumes there is something to fear of death. Is such fear irrational? No, the underlying the fear of death is the fear of God and his judgement. For his eyes are on the ways of a man, and he sees all his steps. There is no gloom or deep darkness where evildoers may hide themsevles. Often times in suicide, man attempts to escape the pain and suffering he exeriences. Yet Isaiah warns us, “What will you do on the day of punishment, in the ruin that will come from afar? To whom will you flee for help, and where will you leave your wealth (Isaiah 10:30)?” There is no consolation or comfort in death. If one truely desires to escape final judgement in death, one must die to oneself and place faith in Christ. For such faith far exceeds anything Davy Jones or any man can offer, giving everlasting life. Aye, come ye sinners, and serve on Christ’s crew, for our captain is unlike any other in the past, present, or future. This debate between Eric Svendsen and Mitchell Pacwa is on the subject of Sola Scriptura vs Sola Ecclesia. The New Attitude audio messages are all now available for free download. This is great for those who can’t afford to go or to purchase the audios. Don’t forget to drop a note to thank them for their service. Update: no need for registration now, they have moved it to another server. Well, interestingly enough, John Loftus, whom I’ve suspect in the past as the source behind various attacks against Christian anonymously or under false guise, have finally been caught cold handed in the act, thanks to the FEED CODE. I first caught news of this from Frank WALTON earlier today, and J.P Holding of Tektonics Ministry was the target of John Loftus. So I thought I drop by Tektonics again (I was on it earlier at 7AM to see if there was any new material on a site that I’ve grown to love and hope to contribute more pieces in addition to the two essay I have there) and a link was given to the TWEB, where Mr. Holding regularly is in the forum of. After much weasling, John Loftus the atheist who just had a recent blog on how Conservative Christians are hateful bigots (because there’s the KKK…lol!) turn out to be a hateful immature bigot himself. He finally confessed to being behind the blog that he set up. Peter Pike (Calvindude) over at Triablogue put it in perspective, and he’s hit it right on the nail on Atheistic hate which was written as part satire but also discusses the issue itself on Secularist bigoted hatred. Then, find a college atheist, a member or a sympathizer of a terrorist group like the Rational Response Squad. Ask him why he hates the Christians so much. Chances are, you’ll hear, “We don’t hate Christians. We once lived in peace with the Christians. We are fighting them to win back our freedom.” I am amazed how people can be so darn good at putting soft-peddle twists on hate speech to make it sound less objectionable. THe three of us who blog for Vertias Domain are active in engaging in Presuppositional Apologetics and evangelism in Southern California, particularly to high schoolers, youth groups, college and grad students and Secular Campuses. WHile following this, I thought to myself of how every anti-Christian I have met never confess their hatred to Christianity though it becomes so evident. YEsterday, during our evangelism, we had a dialogue with a regular atheist we debate with, and the amount of heat was fierce, yet there was little substance. The bulk of his ‘attack’ was ad Hominem and Red Herring, and getting upset that we would use logic since he’s rejected logic in his belief (laws of Identity is not true, no such thing as truth, no laws on Noncontradiction according to a previous conversation we had, science and logic are not compatible, Valid= good induction argument, etc…of course the list here protray a serious problem with his worldview and his own understanding of logic). But he wouldn’t say he’s a hate monger. Ask someone walking by, and you might get something different…where he’s caught with his pants down. 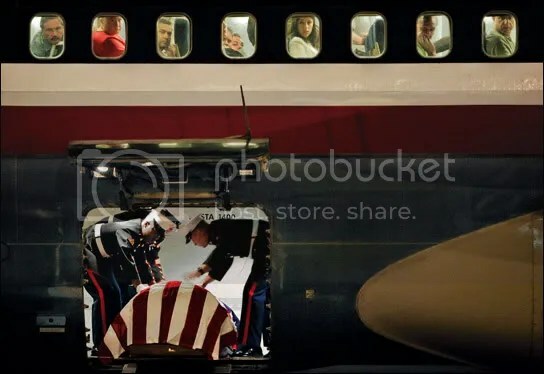 The picture of a Marine’s casket (a 2nd. Lt. Cathey, who left behind his pregnant wife) as contrast to the plane and the people looking out of the window…the contrast is beautifully captured and is almost surreal. Enough with my words. THis picture was part of a series that won the pulizter prize…reading the 19 pages, you would know why. Have tissues nearby, it is very emotional. The American Airlines 757 couldn’t have landed much farther from the war. The plane arrived in Reno on a Friday evening, the beginning of the 2005 “Hot August Nights” festival — one of the city’s biggest—filled with flashing lights, fireworks,care free music and plenty of gambling. When a young Marine in dress uniform had boarded the plane to Reno, the passengers smiled and nodded politely. None knew he had just come from the plane’s cargo hold, after watching his best friend’s casket loaded on board. At 24 years old, Sgt. Gavin Conley was only seven days younger than the man in the coffin.The two had met as 17-year-olds on another plane — the one to boot camp in California. They had slept in adjoining top bunks,the two youngest recruitsin the barracks. sentences, had matching infantry tattoo setched on their shoulders, and cracked on each other as if they had grown up together— which, in some ways, they had. When the airline crew found out about Conley’s mission, they bumped him to first-class. He had never flown there before. Neither had Jim Cathey. On the flight, the woman sitting next to him nodded toward his uniform and asked if he was coming or going. To the war,she meant. The woman quietly said she was sorry, Conley said. Then she began to cry. When the plane landed in Nevada, the pilot asked the passengers to remain seated while Conley disembarked alone. Then the pilot told them why. The passengers pressed their faces against the windows. Outside, a procession walked toward the plane. Passengers in window seats leaned back to give others a better view. One held a child up to watch. From their seats in the plane, they saw a hearse and a Marine extending a white-gloved hand into a limousine,helping a pregnant woman out of the car. On the tarmac, Katherine Cathey wrapped her arm around the major’s, steadying herself. Then her eyes locked on the cargohold and the flag-draped casket. The Associated Press has a piece on the Marines and their problems with getting new types of equipment. Of more than 100 requests from deployed Marine units between February 2006 and February 2007, less than 10 percent have been fulfilled, the document says. It blamed the bureaucracy and a “risk-averse” approach by acquisition officials.